Tantra First Look - Looks Promising With Lots of Thrills In Store! We've got a review of the first episode for you, check it out and share your thoughts too! A Goofy Yet Lovable Family - We like that the show has a traditional family setup and the characters are introduced one by one, making them all very relatable as well as lovable. We love the goofiness between the two 'samdhans'. Sets -That house is a piece of artwork. We love the 'eyes' and the spookiness! And yet it isn't one of those cliche old run down house covered in cobwebs. This is 'that' house of your dreams - so pretty and yet eerie! Background Score - The background score plays a very important part in this genre and we must say it really adds to the eeriness in Tantra. The makers haven't used the same old cliche sounds and took effort in inventing the sounds. 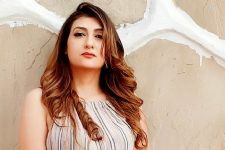 Actors - Faces like Juhi Parmar, Harsh Vashisht, Farida Dadi, Nayan Bhatt, etc are all names we have already seen in theatre and television and they know their craft well. While Manish Goel and Gauri Tonk weren't introduced in the first episode but we know that they too will be assets to the show. Parallel Stories -We love that there are three parallel stories running simultaneously which keeps us hooked. Television tends to follow a linear pattern which the makers have definitely skipped! Choppy - There seems to be a slight 'choppiness' in the episode which perhaps could also be a result of the parallel stories but maybe that could have been avoided. Main Leads - Somehow their chemistry hasn't clicked yet, not in the first episode at least even though the two are seen engrossed in banter and fun. Let's hope that changes as the show goes on! All in all Tantra seems to be promising but lets see what it has in store for us! If you have a review of the show, why not share it with us? Even if it looks promising it's better to not watch the show as with colorsTv you never know when they will pull the plug. Is 'Sonchiriya' the BEST Dacoit Drama since 'Bandit Queen'?